JACKSON, Miss. 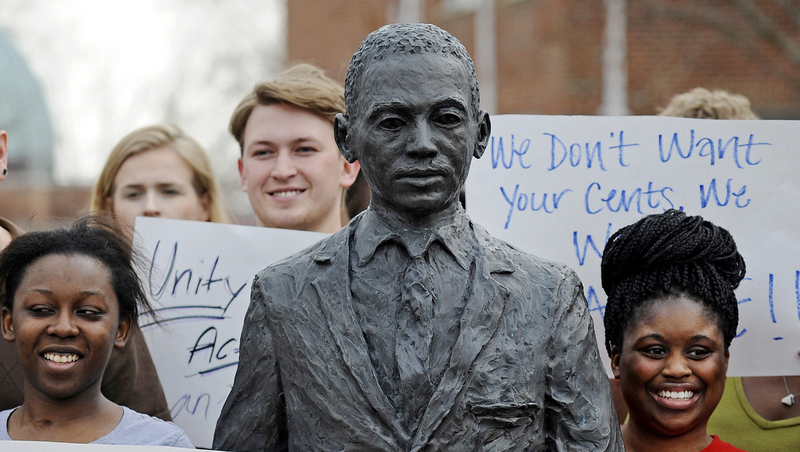 -- A national fraternity group has closed its University of Mississippi chapter after three members were accused of tying a noose around the neck of a statue of the first black student to enroll in the Southern college that was all-white at the time. Administrators have fought against the university's Old South image, banning Confederate battle flags from football games in 2003 and ditching its Colonel Reb mascot for a black bear in 2010. But those efforts have been undermined by unflattering incidents, such as an election night disturbance in November 2012 when some students used racial slurs and profanity to protest President Obama's re-election, or an October 2013 performance of "The Laramie Project" where football players and other students used gay slurs to heckle the play about the 1998 murder of University of Wyoming student Matthew Shepherd, who was gay.